'Essentials' economical Wall Mounted Notice Boards for Schools offer outstanding value. Manufactured from extruded aluminium so they won't rot or rust.. Offered in four sizes to suit your use. Complete with pin board and secure locking. With clear anti scratch front cover. Supplied with a fixing kit & designed to look good and to last. Available with an optional Header Panel. These Notice Boards offer extremely good value for money. Built from extruded aluminium with a anti vandal and scratch resistant clear front cover, they are finished to a high standard and built to last. Locking is via two security locks. 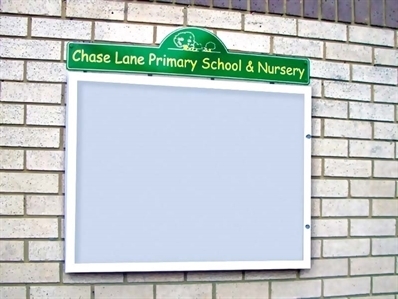 A separate header panel with your message or the schools name and logo is also available and the light grey pinboard can also be upgraded to a colour, both for a small extra charge.